Commercial building owners today are faced with high utility operating costs, tenant demands for sustainable properties, mandated reporting of their performance, and climate action plans. Building stakeholders, including owners, operators, and energy managers, seek to invest in their properties to reduce operating expenses, remain competitive with tenants and increase sales value. 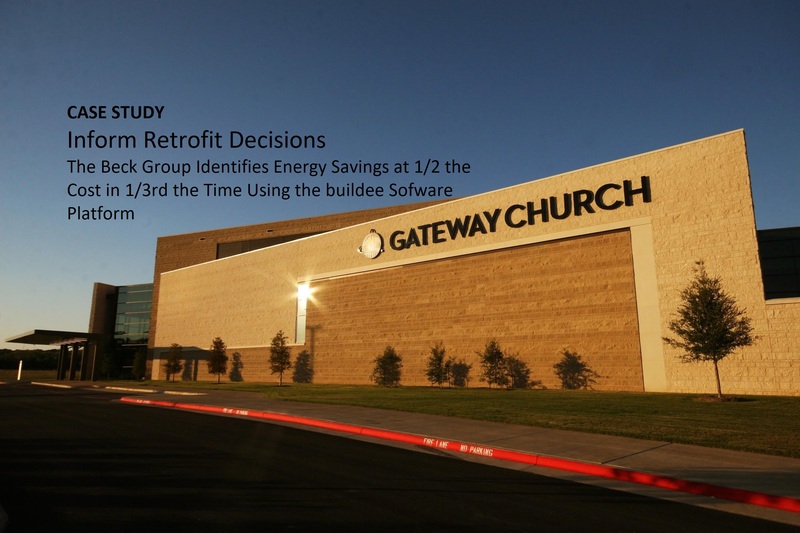 This case study presents how The Beck Group, an integrated architecture and construction firm, used buildee® software to overcome the challenges of high utility operating costs, tenant demands for sustainable properties, mandated reporting of their performance, and climate action plans to more efficiently make lasting and meaningful energy recommendations and solutions to Gateway Church in Frisco, Texas. The Beck Group offers sustainability consulting for building owners who want energy efficient retrofit projects to reduce their building’s energy and operational costs. With the use of buildee, The Beck Group provided a building upgrade plan that would save $11,000 annually while simultaneously improving the quality of the space in terms of thermal comfort, lighting, and air quality.